“The Arkansas Traveler” is one of most recognizable and popular old-time fiddle tunes played today. The tune was first printed on February 23, 1847. 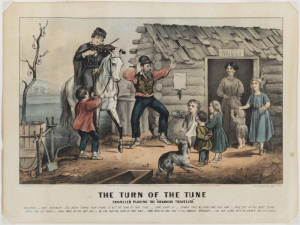 The skit that goes with the tune is said to go back to the 1820s, and some have credited it to Colonel Sandford C. Faulkner, who became known as “The Arkansas Traveler.” The setting of the skit is a farmer playing the fiddle on the front porch of his ramshackle cabin in rural Arkansas. Up rides a city slicker on a horse who is beyond lost. Their conversation is captured in the dialog. This version of the “Arkansas Traveler” is from The Arkansas Traveler Songster, 1864. Stranger: I am very dry – do you keep any spirits in your house? Stranger: Why don’t you cover you house? It’s raining. Old Man: When it’s rainin’ I can’t and it’s not rainin,’ it don’t leak. Old Man: If you are a better player than I am, you can play it yourself. I’ll bring the fiddle out to you. I don’t want you in here. Stranger: A cup of tea, if you please. If you’d like to learn to play “Arkansas Traveler” on clawhammer banjo, fiddle, mandolin, guitar, or dulcimer, I have just the thing. Beginning, intermediate and advanced arrangements of “Arkansas Traveler” as well as 15 other great tunes can be found on my CD entitled “Southern Mountain Classics.” To help students learn the 16 tunes on this CD, I’ve written five instruction books: Southern Mountain Banjo Southern Mountain Fiddle, Southern Mountain Mandolin, Southern Mountain Guitar, and Southern Mountain Dulcimer.